2 bedroom recently refurbished apartment in the centre of Rhosneigr. Within easy walking distance (2 minutes) to the beach and shops with stunning views over Rhosneigr bay. Open plan lounge and kitchen with window seat, refurbished in 2014. Bedroom 1 with double bed, wardrobe, seperate drawers, bedside tables and laundry basket. Bunk beds, tall boy and side drawers with small TV (for dvd's only) in room 2. Fully tiled walk in shower with separate sink, WC and storage cupboard. Underfloor/central heating throughout. Enclosed communal grassed area outside, off road parking space. Storage box outside the apartment door. Helen and Roger have been coming to Rhosneigr for more than 10 years. We love coming here for the beautiful beaches, the watersports and outdoor activities as well as seeing the friends we have made whilst staying here. Roger is a watersports enthusiast, enjoying kitesurfing and Stand up paddle boarding in the bay. Helen enjoys running along the beaches and quiet country lanes, often in the trails in Newborough Forest and out to Llandwyn Island. We bought the apartment in 2014 after a long search. 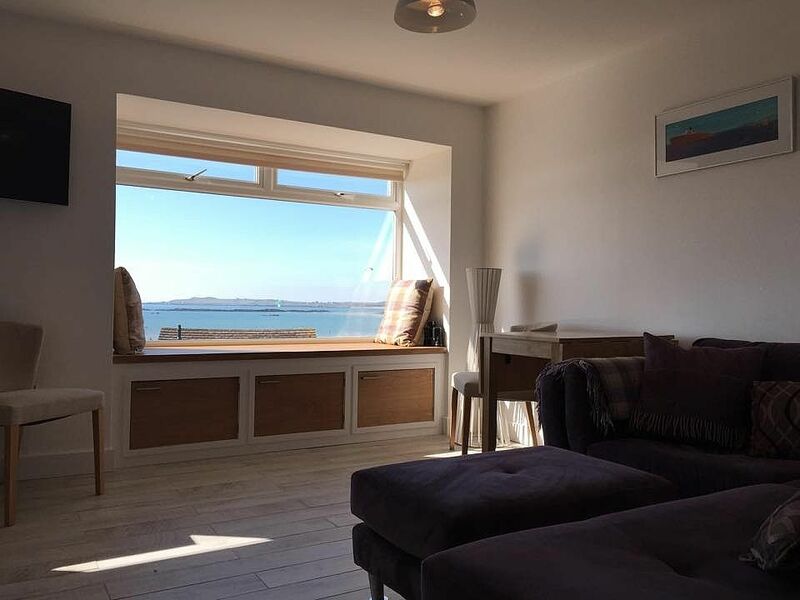 We chose this property because of the stunning views across Rhosneigr bay to Rhoscolyn. The flat is in the centre of the village, within easy walking distance of all the amenities. We enjoy the convenience of looking out of the window to decide whether to start the day in the water with a surf or paddle board or a run or alternatively more slowly with a short walk down the beach before breakfast in one of the many nearby cafes. The location also allows a very short walk home at the end of a day on the beach or a night out at one of the pubs, bars or restaurants in the village. Breathtaking sunsets over Rhosneigr bay towards Rhoscolyn over Starvation Island. Easy access to two wide sandy beaches within walking distance. Bathroom tiled throughout with large walk in shower, WC, hand basin, heated towel rail and underfloor heating. Separate storage cupboard and hooks for towels, wetsuits etc. Lounge with corner sofa, Smart TV (so that the internet, i-player etc. can be viewed on the large screen) and separate DVD player. Large window seat overlooking the bay with storage underneath. Dining table and 4 chairs. Underfloor heating. Notes on accommodation: One pet will be accepted by prior arrangement with the owners. Outside: There is a walled garden at the front of the apartment where children can play provided that they are supervised if they are young. There is off road parking in a private parking area at the rear of the property. A storage box is provided outside of the apartment for toys, wellington boots etc. Cleaning / Towels / Linen / Maid service: Towels and bed linen included. There is a launderette close by in the village. For longer stays additional cleaning and towels can be offered mid-stay at a reasonable additional cost if required. Other: Hallway with lots of hooks for coats. Accessibility: Steps lead up to the apartment from the parking spaces. There are three steps up the the apartment from ground floor level. This property is fabulously located for the village and beach. All a few minutes walk away. The views from the property are stunning. It's a small property but kitchen is well equipped although no dishwasher or washing machine. Main problem was the shower in the bathroom. There was a note in the owners manual not to remove the showerhead or it breaks and when we used it the water came out as a trickle. Made showering a bit tricky. Hot water is controlled by a switch in the kitchen but even when left on for some time the hot water ran out very quickly. We just felt that if you're paying money to stay somewhere these basic things should work efficiently. It's fine for a short break but I wouldn't stay for longer. Dear Justine. I am sorry you had problems with the shower during your stay. The shower was replaced recently so we will look into the problems and rectify them. We haven’t had adverse comments regarding the water heater before so will arrange for that to be checked too. It is important to us that guests have a comfortable stay, We do ask that guests let us know if you have problems during your stay so that we can do our best to sort them out for you. I am sorry we didn’t hit the mark during your break as we try hard to get there to ensure you have as comfortable a stay as possible. Kind regards. Helen. Great property close to village amenities with stunning coastal views! The apartment was in a great location in a lovely village. I stayed for 3 nights with my Mum and 2 dogs and had all the facilities We needed for a great stay. The property was clean and modern but the best part of the stay has to be the amazing coastal views, the beach was also a 2 minute walk away. The village itself has great facilities, dog friendly pubs, convenience stores, take aways, pharmacy plus a few local gift shops. The village is also ideally located for exploring the beautiful island of Anglesey. During our stay we enjoyed visits to Newborough Warren including Llandwyn Island (strongly redommended), Penrhos coastal park, Aberffraw and Bearmaris. Helen was a great host, very helpful and quick to respond to messages. Would certainly stay again. A lovely apartment great views and literally a stones throw from the beach. Trains stop on request at Rhosneigr station. Close to the port of Holyhead and easily accessible from the A55. Rhosneigr is a thriving village including 2 convenience shops within easy walking distance of the apartment and the Y Morfa and Glan Neigr pubs. There are numerous cafes including the Surf Cafe, Mojo's creperie and Chaplins ice cream parlour. Restaurants include Sandy's, Sullivan's The Sandymount and the nearby Oystercatcher with Will's Bar for evening entertainment. Watersports equipment can be hired from Funsport including kayaks and stand up paddle boards. They also provide lessons in windsurfing, kitesurfing, surfing and SUPing. The Anglesey Sea Zoo and beautiful wooded beach walks at Newborough are within close driving distance. Booking Notes: These terms take precedence to those on the Owner's Direct correspondence/website We can consider Sunday PM to Friday PM bookings outside the advertised periods by prior arrangement. Changeover Day: Saturday in high season Owner: Helen Davidson and Roger Thompson Owner’s phone contact details: 07977532705 or 07816584046 Guests: As per information supplied at booking, name and address of each guest to be supplied to Owner immediately after booking on confirmation form. Number of Adults: As per information supplied at booking Number of Children: As per information supplied at booking Pets permitted: (see conditions below) As per information supplied at booking, cost per pet as per information on website Check-In Date: Date as per information supplied at booking. Time of check in as confirmed by Owner prior to or shortly after booking Check-Out Date: Date as per information supplied at booking. Time of check out as confirmed by Owner prior to or shortly after booking Holiday Period: From the Check-In Date to the Check-Out Date Deposit Payable (for reservation of property): £125 - not returned if booking is cancelled unless all dates cancelled are re-booked by another guest. Rent: As per information supplied at booking for the Holiday Period Security Deposit (in addition to Rent): £100 Please note this a no smoking property Booking terms, conditions and regulations apply which will be confirmed on the booking confirmation form supplied by the Owner once the reservation Deposit is received. Details of the booking terms, conditions and regulations can be supplied on request prior to booking/payment, please contact the Owner for details.